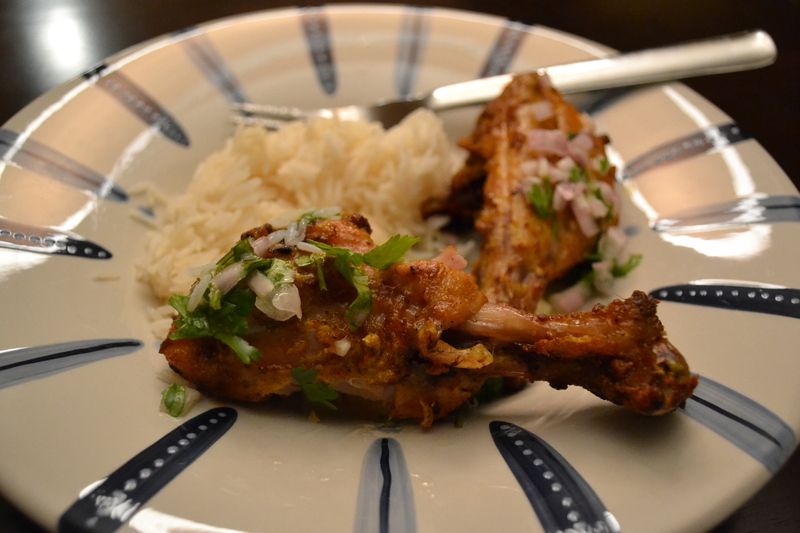 even though drumsticks are high-maintenance these were really good… the cilantro relish really made this dish! do not leave it out! 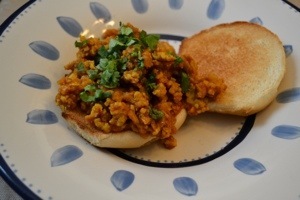 served this with some garlic naan from tj’s yum! 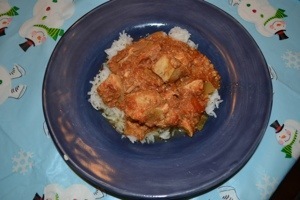 add the chicken, onion, and garlic, curry powder, ginger, cayenne, salt and pepper to crockpot. Stir the mixture to combine and then add the beans, tomatoes, broth and bay leaf. Cover the cooker and cook on high-heat for 4-1/2 hours. 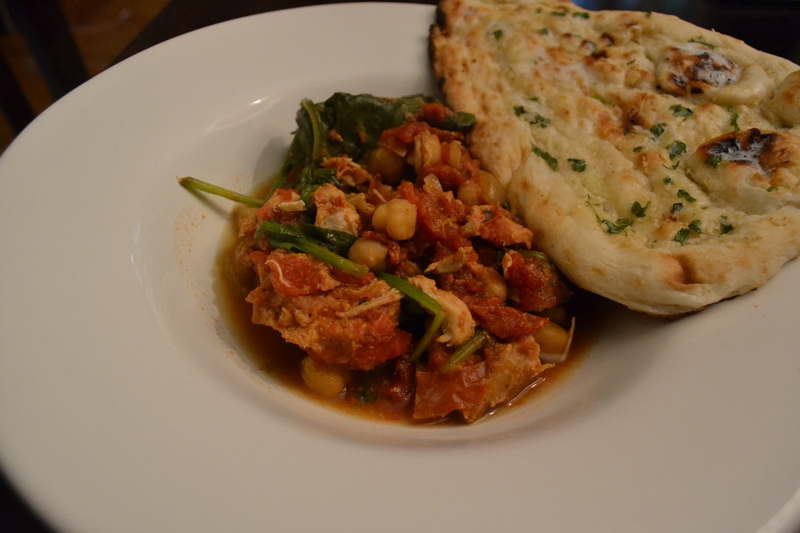 Uncover the cooked stew and stir in the lime juice and the spinach. Let stand for 3 minutes. 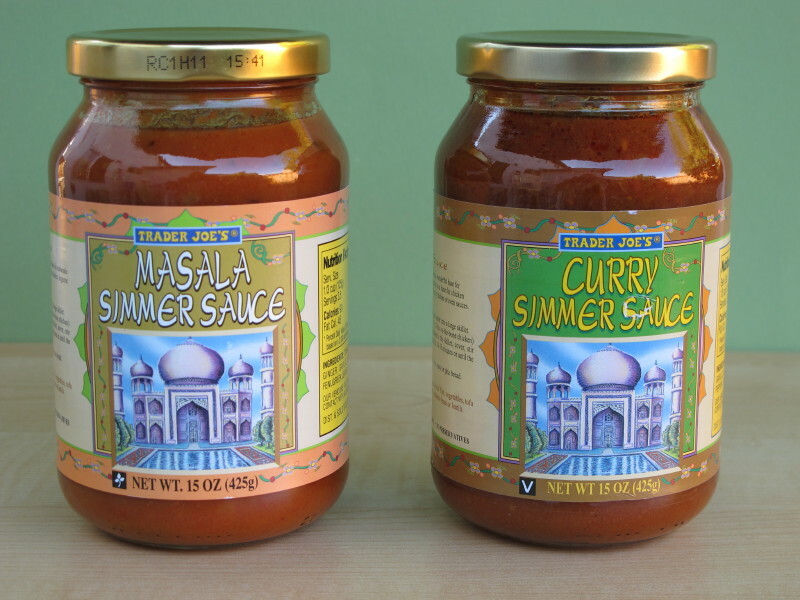 I was shopping at trader joes a couple of weeks ago and came upon the samples they were cooking up. It was the strangest combo of ingredients I’d ever seen. Lentils, cabbage and curry sauce all mixed together. I tried it and surprisingly it was really good so I bought all the ingredients. And how easy is it to make? Just throw all the ingredients together into a pot with one cup of water and heat through! 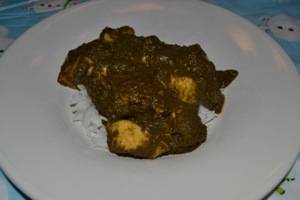 The first time I made it I used the masala simmer sauce and it came out good. The second time I used the curry simmer sauce and it came out really good. The curry version had a nice kick. Both times I threw in rotisserie chicken. Yum. When I made this the last time I was out of coconut milk and had to improvise. This time I had the coconut milk but used ground turkey insteAd. Yum! 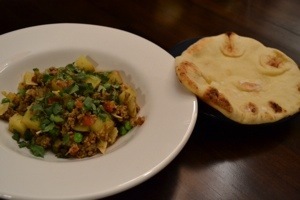 I made keema once before and thought I’d try a different recipe this time! This one didn’t disappoint either. Think I would decrease the cumin next time. I served with tjs garlic naan. 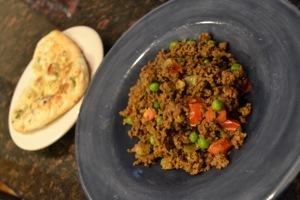 Stir in cumin and next 5 ingredients, and cook 1 minute over medium-high heat, stirring often. 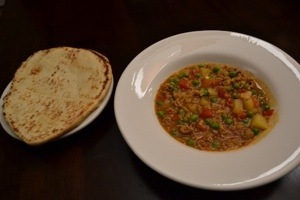 Stir in tomato and peas. Cook 4 minutes or until thoroughly heated. Serve with lime wedges. sloppy joes are always a good quick meal. There’s also a lot of variations on them! This was one was just ok. In a large skillet, heat the EVOO, 2 turns of the pan, over medium-high heat. Add the meat and cook to brown well, 7 to 8 minutes. Add the onion, ginger and garlic; season with salt and pepper. Stir in the turmeric, cumin, coriander and chili powder. Cook, stirring occasionally, until the onion is softened, about 5 minutes. Stir in the tomato sauce and honey, lower the heat and simmer until ready to serve. Layer the roll bottoms with the sloppy joe meat, cilantro, and roll tops. I ripped this recipe out of weight watcher magazine. They had it under the 15 minute dinner section. It came out pretty good and quick. 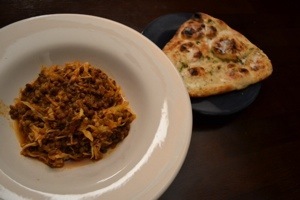 I served with tjs garlic naan. Yum! Add spinach, raisins and pine nuts. Brave yourself for the picture I took of this dish.. I won’t even say what the munchkins said it looked like! This smelled soooooo good while cooking, but definitely didn’t live up to the delicious aroma while cooking. We tossed the leftovers… Better luck next time! Layer half the spinach along the bottom of your slow cooker. Then add the onions through the chili powder. Add a big pinch of salt and pepper. Then press down the other half of the spinach on top of everything. It will practically be falling out everywhere. Press the lid down. Now turn the slow cooker on to low and let it simmer for 3 hours. Check on it a couple of times and give it a stir. After three hours, pour the saag into a blender and purée it. Pour back into slow cooker. Then let it simmer another two hours. 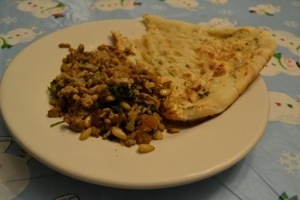 Serve over a bed of cooked white (basmati or jasmine) rice and some torn toasted garlic naan! And oh! Some good cilantro! And oh! Maybe some fresh lime juice if you want to wake it up a little. This was eh.. Not enough flavor for me. Munchkin #1 loved it though! Use a 4-quart slow cooker. Put the chicken into the bottom of your pot. Add onion. Pour in the tomatoes, and add garlic and all spices. Cover and cook on low for 6-8 hours, or high for 3 to 4. stir in the yogurt. Serve over rice.